April, April, der macht was er will. So the saying goes in Germany to explain the wildly changing weather during April. Glorious sunshine one week, damp conditions the next. At not long after dawn, the THCC convoy of three cars and an ICE set off for Göttingen, with heavy rain falling either side of Hannover (thankfully we weren’t playing there). Things were a bit better in Göttingen, which is a pleasant little city in Lower Saxony and home to a group of very nice cricketers. THCC won the toss and decided to bowl. New player Imran joined the team (and was given ball-drying towel duty) while Raman made his first appearance in the XI. Like last Sunday, it was a slow start, but Bipin was bowling very well, swinging the ball and getting good bounce. He bowled opener Premnath, had the Göttingen captain Karangaraj caught behind and finished with 2/15, with five maidens from his eight overs. From there, wickets fell at steady intervals, with only opener Gowtham standing firm with a straight bat. It took a rank long-hop from Cam to dismiss the stoic opener, caught by Aman at mid-off, but the ball was more deserving of being hit for six and the THCC players in Gowtham’s vicinity apologised. Despite bowling utter rubbish, Cam picked up three wickets and was deserving of none. Israfeel took two and was deserving of more. But the bowler of the day was without doubt Kamaladin, who finished with the miserly figures of 9.5 overs, 3/12. His line and length were outstanding. Göttingen were all out for 84, with the total boosted by 37 extras. While the bowling still needs work, the fielding was a vast improvement on the previous week. Great catches were held, including a super effort by Raman on the run, and fast balls were stopped. Steve was solid behind the stumps, taking a catch that was so good it required a lap of honour around the pitch. Rain fell in the interval. The Göttingen players were quick to get the covers out. When THCC started the run chase, there were a few damp patches on the pitch, but otherwise it played very well, with good bounce and plenty for the bowlers to work with. Dom (on strike) and Cam batting. Dominique and Cam were watchful. Göttingen bowled with impressive discipline, not giving away free runs and sticking to a good line outside off stump. The runs were coming mostly off the bat, as Dom and Cam pushed the score up to 49. Then Cam was out caught behind, with the THCC skipper pausing long enough to realise he had made a complete idiot of himself, then trudging off the field and doing a walk of shame around the field to complete his idiocy. Guru and Dom took the total up to 75, ten runs short of victory, before three wickets fell. Things got a little tense, but a mighty six from Steve and a single from Raman finally got THCC over the line, winners by six wickets. 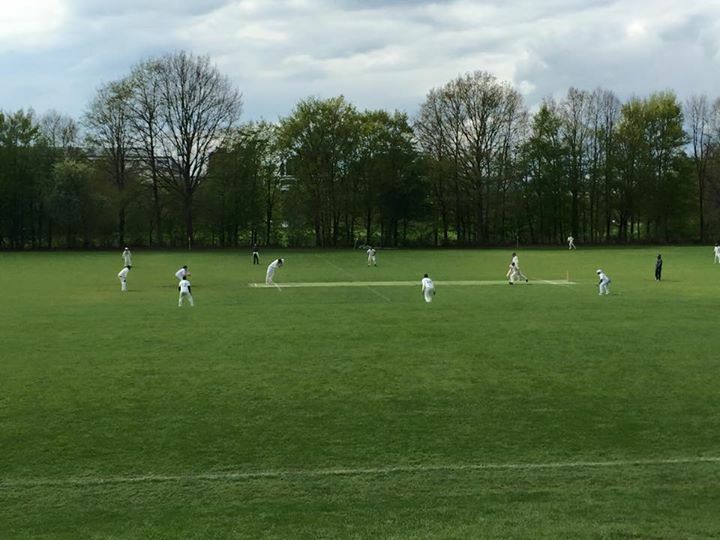 Thanks to Göttingen for another great day of cricket. Thanks to Tina for scoring and to 12th man Satish.